This tilt and slide timber window has been designed and tested to form, when correctly assembled and installed to the requirements of BS 6375 Part 1: 1989 (for air permeability, watertightness and wind resistance). 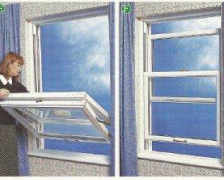 The Tilt-back facility allows easy internal cleaning of outside panes. Glazed in 24mm clear low e soft coat argon filled warm edge double glazed units as standard. Fully spray painted or stained using Teknos microporous paint in any RAL or BS colour.